The A series plastic pallets “light” from Twinpack Special Products are versatile and very affordable. These plastic pallets are available in the Euro pallet size 800×1200 mm. They are standard made of new HDPE materials, but we can also supply made of recycled material. The Light plastic pallet from the A series is a perfect export pallet. Very strong, yet cheap and available from stock. The standard A series 800 light comes in white and black. From 250 pieces you can choose your own (RAL) colour. The raw materials we use for the production of our A-Series Pallets are the best available in the market. Whether you choose the virgin material or the recycled version, you can rely we only use the best to grant you a long life time use. All boards of the A-Series Pallet are re-inforced. The boards are 1.5 mm thicker compared to other plastic pallets. Since we only use the very best raw materials available in the market, the A-Series Pallets can be used in both low and high temperature surroundings. We also use UV protectors in our materials, delaying the aging proces of the plastic. From 250 pieces you can choose your own (RAL) colour. To make identification of your A-Series Pallet more easy, we can put a name and/or a logo at the blocks (see picture). The recycled A-Series Pallets comes standard in black. Both the 800 and 1.000 series in this color are permanent available. To make identification of your A-Series Pallet more easy, you can choose to print a name and/or logo on the blocks. We use 4 different colors, black/blue/red/yellow, from which you can choose. To use the A-Series Pallets in drive in – drive out racks, we can reinforce the A-Series Pallet with 2 stainless steel profiles. This is the ultimate and safest way to use the A-Series Pallets in racks. To enable our customers to use the A-Series Pallet in automatic racks, we followed the sizes of the EPAL pallets. 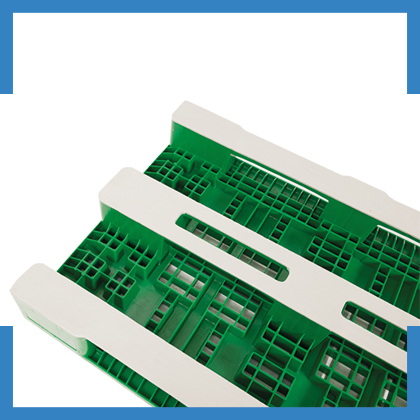 Although the A-Series Pallet is very strong and durable without the runners closed, in some situations closed runners are required. This often is the case within the food industry. The material we use to close our runners, is the best available in the market and therefore durable and very long lasting.